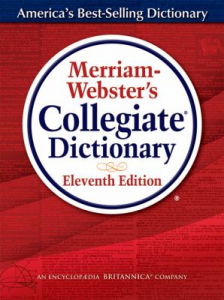 Merriam-Webster’s Collegiate Dictionary – BANNED! How many times did your parents or teachers say “Look it up in the dictionary?” The dictionary most people in the U.S. think of when they hear that phrase is the Merriam-Webster’s Collegiate Dictionary. The direct descendant of Daniel Webster’s dictionary, it remains the best-selling desk dictionary in the country. It was banned by the Menifee Union School District (California) in 2010 for its graphic definitions. During Banned Book Week, come to the library and look up a word in a banned book! If you’re interested, Slate published an interesting analysis to determine which desk dictionary is best – spoiler alert! – it was Merriam-Webster’s Collegiate Dictionary. ← Eleanor and Park – Challenged!